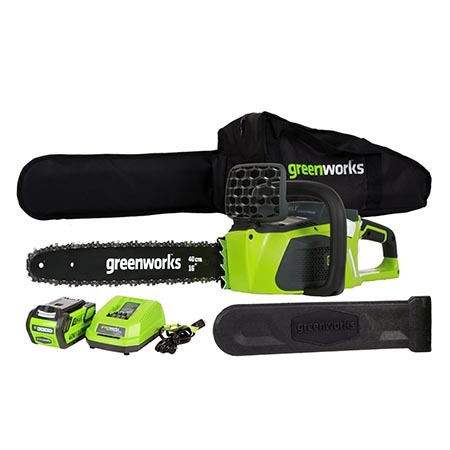 The Different Chainsaw Power Packages - Go for Power or Go Green? When it comes to chainsaws there isn’t much of a dispute about which ones are more powerful. If power is your main consideration then a gasoline-powered chainsaw wins hands down every time. The first chainsaw I ever owned was an electric corded model and it did an okay job, but it simply didn’t compare in terms of power to my best friend’s gasoline-powered chainsaw. That thing cut through wood like a knife cuts through butter. My electric chainsaw did the job, it’s just that I really had to work at it. I sure got a great workout though. 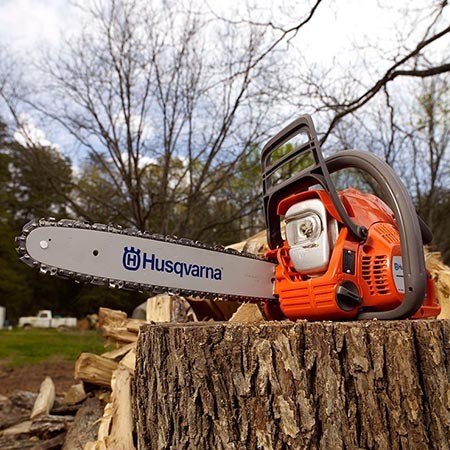 Power isn’t the only consideration you should keep in mind when purchasing a chainsaw, though, so it’s not necessarily a black-and-white, hands down slam-dunk that a gasoline-powered chainsaw is the best option for you. There are number of other considerations you have to think about such as weight, the environmental impact of your machine, maintenance, and potential safety concerns. Nothing is ever quite as simple as it seems and that’s definitely the case when it comes to choosing the right type of chainsaw. When I first set out on my own personal journey to find a replacement chainsaw for my electric model I was convinced that I had to go with a gas powered chainsaw. 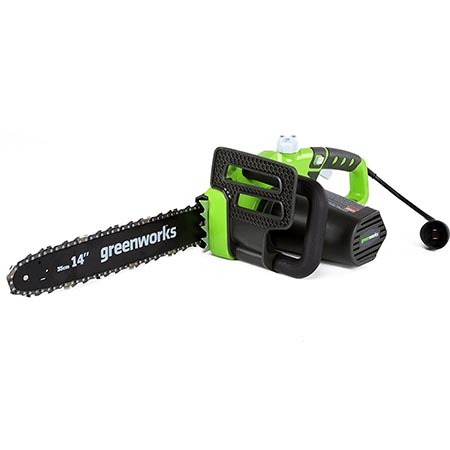 I liked the idea of that extra power I would get when I pictured myself cutting through large branches with one of these. After I settled down from my initial euphoria, I began to really think about what my needs were. Gasoline-powered chainsaws certainly have some extra cutting power, but they also have their drawbacks. Anything powered by an internal combustion engine requires regular maintenance. That means you have to worry about oil changes and you have to make sure that all of its various parts are in proper working order. At the very least you have to do maintenance every spring. The other thing to keep in mind is that a gasoline-powered chainsaw is probably going to be a lot heavier due to the weight of the engine. If you have any type of health issues that require you to take it easy and avoid heavy lifting, a gasoline-powered chainsaw may not be the right choice. Another popular option when it comes to chainsaws is a corded electric model. These chainsaws have some very real advantages. First of all, they don’t run on gasoline so you don’t have to worry about making sure you have enough fuel on hand – all you have to do is make sure you have an extension cord and an available wall outlet. Electric power is also a lot cleaner, which means you can perform any cutting jobs you may have without worrying about any serious environmental impact you may be creating. In fact, an electric chainsaw is a zero-emission power tool. The fact that it lacks an internal combustion engine also makes it a lot lighter and easier on the body. For all of their advantages though, they do have some problems. They don’t come close to creating the same amount of cutting power that you have available when using a gasoline-powered chainsaw. Electric chainsaws also need an available electrical outlet and a fairly lengthy extension cord. It can be frustrating having to work around that cord and it also limits how far you can reach. If you have a few acres of property, chances are an electric chainsaw won’t work for you. If you’re determined to do your part for the environment, but an electric-powered chainsaw with a cord simply isn’t practical, you may want to consider a lithium-ion battery powered chainsaw. These share many of the advantages of an electric saw – such as their minimal impact on the environment – but they can be used just about anywhere as you’re not limited by a cord. As is the case with electric chainsaws, battery-powered chainsaws are relatively light because they don’t have an internal combustion engine. That makes them a lot easier to work with and they are great if you have any kind of physical limitations. In theory, you get all the benefits of an electric chainsaw without having to worry about that pesky cord. Unfortunately, one of the main complaints about battery-powered chainsaws is that the charge never seems to last as long as you would like it to. You’d be hard-pressed to find a battery powered chainsaw on the market today that hasn’t received a few criticisms about lasting power. One possible solution is to make sure that you always have a secondary battery on hand that’s charged and ready to go. The other problem you may run into with battery-powered chainsaws is that they don’t seem to have the same amount of power as other chainsaw types – even electric models. You definitely wouldn’t want to use one to cut through solid hardwood in most cases. If you’re simply using one in the back yard for cleaning up the bushes and pruning a couple of trees, they’re ideal. powered chainsaws are certainly more powerful, but they do impact the environment in a negative way. If you don’t need all that power and you’re concerned about the environment, an electric or battery-powered chainsaw may be perfect. The key is to look at the overall picture and examine your needs closely before making your purchase decision.